Meet Roberta and John Nielsen. They live in Santa Barbara, California. 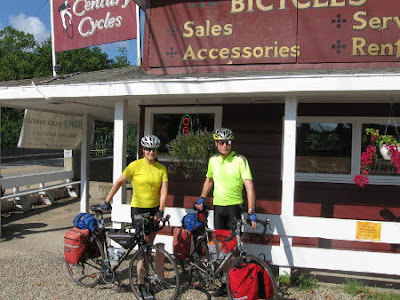 Every year they take a look at a map and decide where to take their next bicycle touring trip. This year, they decided to go to Rochester, New York, and follow the Underground Railroad Bicycle Route to Cincinnati, Ohio. This brought them past our Peninsula store yesterday, where we did some adjustment to John's bottom bracket. You can read tales of their past adventures on their blog at www.dogdander.com. He was riding a basic Specialized road bike; nothing special. She, however, had a sweet custom Gunnar touring bike. Carbon fork, Chris King headset, Ultegra/105 drive train. Well, I suppose I should clarify...John's Specialized is definitely a nice bike, with or without his Dura-Ace and Ultegra. By "nothing special," I meant that it's a good, off-the-shelf road bike--every bike company has a road bike with Ultegra and/or Dura-Ace, and there's nothing wrong with that--I have one, too. We, here in the the bike shop-rat world, tend to be impressed by things that are different from what we see every day. A custom-built bike, from a small boutique brand, decked out with bling-y components that make it fast and light, while still retaining its true touring-bike soul: now THAT'S special!